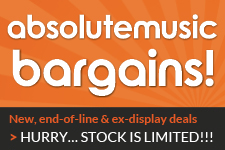 Absolute Music stocks a huge range of the best MIDI controllers for music production and performance, including keyboards, drum pads and foot controllers from top brands including Akai, M-audio, Native Instruments and Novation. Be sure to also check out the various MIDI controller bundles that we have on offer, alongside various other exciting special offers. We love music gear here at Absolute Music and we strive to stock the best equipment such as USB/Firewire interfaces, Midi controllers and software. When you buy a Midi Controller from Absolute Music you are buying from a Google Certified Shop with a huge stack of positive Feefo reviews and we only ever ship from our shop in Dorset, meaning that we can offer free next day UK delivery on all orders over £99 and finance is available on orders over £399. The ultimate mixer, effect and instrument controller for Ableton Live, providing 24 rugged LED-enhanced knobs, eight 60mm faders and 16 multicoloured buttons for tight, integrated control.